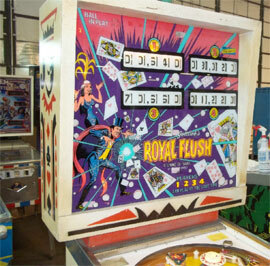 Check out these Gottlieb Royal Flush Pinball Machines for sale. You will also find parts and accessories for current owners including the drop targets, rubber ring kits, decals, manuals, translites, flyers, and sling shots. 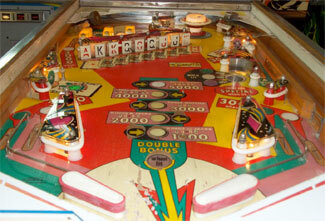 Same game as Gottlieb Card Whiz, but four player instead of two. The object of the game is to get the three jokers - red, green, and white. There is also a kickout hole that will collect 1000 to 4000 points. Solid game play and classic card design!